Representing a summer breeze - Awelon in Welsh, dancing through Welsh woodland, mountains and coastline, this beautiful sterling silver and 9ct rose gold ring is set with sparkling peridot. All Clogau Welsh jewellery contains a touch of gold mined from the Clogau St David's gold mine - the very same gold used in generations of royal jewellery. 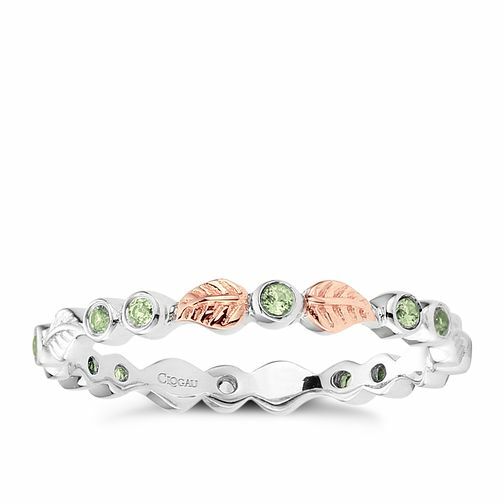 Clogau Sterling Silver & 9ct Rose Gold Peridot Awelon Ring is rated 4.0 out of 5 by 2. Rated 4 out of 5 by Anonymous from Very pleased with the quality I have 2 granddaughters who are very fussy about earrings they wear, the selection you had was brilliant and to top that, the trinket boxes were also lovely. The choices you had will make their eyes light up and sparkle. Thank you very much.